The Vaudois in the 13th century are christians who claim the mass in popular language, the bible for all, and refuse the confession. Having been assimilated with the cathares they are massacred at the same time and become clandestine during two centuries. The Vaudois valleys of Italy beyond the Quéras, between the Italian border and Turin are the twin of our Cévennes. End 1490 the Protestants unite in the Cause under the threat of the intolerance of the catholic might. The questions arise on the essentiality of the faith and the convictions, as by example by Erasme. The detonator: case of indulgences: To build Saint Pierre of Rome the pope sends monks to sell certificates of indulgence to go to the paradise. 1517 The lord of Cadoine with Saint-Etienne-Vallée-Française, was already sensitized with the Lutheran thought, he preached the ideas of Luther and was imprisoned. Luther posts 95 theses which were going to give rise to the Reformation The arrival of the reform is synchronized with the development of the industry of silk. Produced in Anduze, delivered in Nimes silk went back by the Rhone to Lyon. Banking exchanges are done with Geneva were stays Calvin and the debate on the structure of a civilization opens broader. 1534 Calvin publishes his book on the Christian institution. 1540 Anduze: first city or preached a priest cordelier; he was hung three days afterwards. 1550 The elimination of illiteracy was very advanced in the area. In the majority of the villages, even most moved back, there were elementary schools or one learned how to read to the boys . In almost all the houses, there was a bible and somebody who could read. Another reason for the great impact of Protestantism was probably the descent of Cathares. Appearance of the great movement of conviction by the built of temples - Anduze, Saint-Jean-du-Gard, Saint-Germain-de-Calberte and Barre-des-Cévennes. 1550 / 1560 Protestantism is adopted officially in the oldest churches* of the Cévennes. Conversion is done massively in the Cevennes for example: in Meyrueis, on 4224 inhabitants, 21 only remains catholic. The only exception is Fraissinet de Fourque (because of its authoritative priest) and St-Andre-of-Majenca. 1560 Of the 18 million inhabitants in France, the 7 to 8 million Protestants feel menaced. 1562 The tensions between Roman Catholics and Protestants start to worsen. The Duke of Joyeuse besieges Marvejols and destroys the three temples of Marvejols and St Leger de Peyre. 1586 Henri IV, Protestant, succeeds the throne, up to 1610.
liberty to practise the Protestant worship, which had already been authorized in some villages, where the lord was Protestant. to be aloud to practice all functions and all trades. to profit from special courts known as "Chambres de l'edit" (edict-house) where sat at an equal number of the Protestant and catholic judges. to have approximately 70 cities, boroughs or castles to be used as places of refuge : La Rochelle, Montauban, Castrate, Montpellier, Nimes, Uzès, Privas, Montélimar. The freedom of the worship is respected until the death of Henri IV in 1610. The successor of Henri IV, Louis XIII and especially his minister Richelieu did not have the same opinions on Protestantism: they wanted to eliminate the Cause, i.e. the party of the French Protestants. 1620 All that was not expressly authorized becomes prohibited. The party of the French Protestants, the Cause is too independent and thus unbearable to the royal power. 1620 - 1630 war of Rohan. Duc Henri de Rohan (son-in-law of Sully) having kept the Protestant religion, reunites the cities of the South and the West to revolt against the King. 1622 Alès and Montpellier are entirely destroyed. 1628 The Protestants make recall abroad; together with the English, they besiege La Rochelle for thirteen months. The most famous episode of the fight against the Cause was the recovery by the royal troops. The castle of Meyrueis is besieged by Rohan. The Duke agrees to negotiate. 1629 The peace treaty of Alès recognizes the right to the existence of the Protestant churches but removes the places of refuge and the garrisons. 1630 The grace of Alès puts an end to the wars. All the rights of worship are restored. But the king orders the destruction of all the fortifications of the cities having taken part in the revolt. Without Richelieu, France would have been split in two parts : a Protestant South and a Roman Catholic North. 1685 The Edict of Fontainebleau known under the name " Revocation of the Edict of Nantes " makes the life unbearable to the Protestants, called huguenots, calvinists or injuriously: parpaillots, fanatics or even heretic. With the prohibition of the Protestants to be buried at public cemeteries appeared the cemeteries family near the farmhouse, (ou sometimes even in the court). The traditional burials are marked by two slate-stones and, as from the 19th century, often by a cypress which symbolizes the flame of eternity. 18 october 1685 The Edict of Fontainebleau known under the name " Revocation of the Edict of Nantes " renews the long and bloody persecutions of Protestants. The Huguenote cross, made by a goldsmith of Nîmes, to protest against the Revocation of the Edict of Nantes, becomes the cross of Languedoc. It carriesn lily-flowers in heart and a dove or a tear. Everybodies obligation is to be Catholic, and to go to the mass. For 3 not justified absences, one was declared rebellious and embarked as galley-slave like real criminals. The place were the families came to say good-bye to them as they left for Marseille by feet is called the "col de l'exil" at the "corniche des Cévennes"-road. They were chained to row for 6 months, night and day, from April till All Saints' day. Even during their emprisonment the Huguenots had to quit their oar to pray Catholic prayers thrice a day. They were 5 people at one oar of 10 m and 300 kg. They spent winter in the arsenals of Marseilles in the powder factory at "la Canebière". The women were emprisoned in the Tower of Constance in Aigues Mortes. Marie Durand will remain there 39 years. The record will be held by Anne Salièges locked up at 6 months with her mother, released at 71 years in 1772, because she has been forgotten there. She will return to die in Vebron. At the time in France, the belief of the king had to be that of the people, thus Louis XIV appointed the Bishops. The bishop of Mende charged the abbot of Chaylas, a catholic priest born in Chayladence beside Langogne, to supervise the practice of the catholic belief in the Cevennes : the Protestants presence at the mass, and of their forced conversion into Catholics. For this he was assisted by the very cruel soldiers of the king, the Dragons, clothed in red. More than 20 000 soldiers exerted this pressure, the so-called "Dragonnades". People were obliged to lodge and nourish them and had to pay their pay. July 28 at Barre de Cevennes, at the famous Madeleine-fair an attempt to set free the prisoners finishes badly with deaths by stabs as Chaylas with his soldiers surprises them. In 1695 a movement of young modest people spread out, they started to preach: " leave large Babylon". Babylon means corruption, rot and Catholicism. A reproach to the NC (new convert - the so called "nes") to disavow the Protestant faith. 1698: Execution of prédicant Brousson. All these hatreds plus the "Dragonnades" results in the beginning of the War of Camisards. July 24, 1702 Under the rise of violence which degenerates, the abbot of Chaylas is assassinated in Le Pont de Montvert with 54 stabs. This is the commencement of the Camisard-war . Some Protestants of Barre de Cévennes leave the wood of Altefage to release the prisoners. From 1702 to 1706 the Cevennes were harassed by this war. The name of "Camisards":1ère assumption: the resisters were wearing long shirts (camise=chemise). 2nd assumption: (surer). The word Camisard would come from "camisado": attack on the ways in ambush. The camisards engage by groups of 20 to 50 people, each group having a determined sector to defend. These men, born in this area, being agriculturists and shepherds, know the least recess of it. They do not engage in arranged battle against the more and better armed troops, but tighten ambushes, assail the troops unceasingly and disappear very quickly afterwards. Thus, some 2000 camisards hold in failure 25 000 soldiers and millicians. These Guérilleros acted with the complicity of all the country, except the noble ones. Only the "baron of Salgas" did not disavow and left for the galleys. His birth-certificate is torn to pieces and his castle destroyed. Once released, he went to Switzerland to die. The richest all left the region, 800 000 on the whole, between whom some very clever ones like Denis Papin who develops the machine with vapor in England. The people, poor and courageous, remained to fight. The dragons with horses, boots and sables of 1m50, were rather clumsy at the small paths. The resistance of the camisards resembles a miracle, considering their number and their equipment. The secret weapon of Camisards: a song, psalm 68 of the bible, the song of king David. The soldiers fled only by hearing it. The first Sunday of September, it is always sung at the assembly of the Desert at Mas Soubeyran ("muséé de désert"-were's born and burried Roland, one of the most courageous camisards-leaders ) near Mialet. Until the end of the war people left to hide in the mountains to escape. It is the period of the "DESERT". In December 1703 the patience of Louis XIV is to it's end, he decides to destroy the country. Until March 1704, 474 farmhouses and hamlets are burnt down. Louis orders to off-set the inhabitants of the villages of less than 100 inhabitants, towards Canada and South Africa. The inhabitants of Saumane in the Vallée Longue were prisoners during 2 years in Sète, then off-set in South Africa. At the village "Somane", close to the Cape, one speaks French today. March the 1704 protestestants succeeded in demolishing a navy-regiment. May 1704: Cavalier - another camisards-leader negotiates with the marshal of Villars. 1705 End of the war by a large fire of the Cevennes. 1706 Certain leaders were killed like Roland, others surrendered and were put in prison. 1710 the last Camisard-leader, Abraham Mazel, is killed. With the end of the reign of Louis XIV, the tolerance returns. 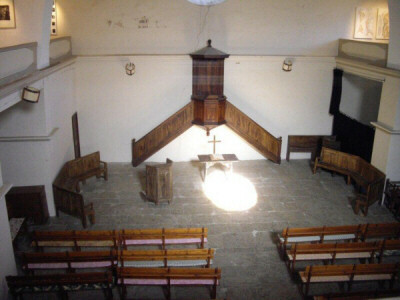 August 1715: Antoine Court reconstitutes the clandestine Protestant Church in the Cevennes. 1733 Everyone is rebaptized. For certain it's the third time: Protestants of birth, catholics by force (N.C.-"new convertis") and again Protestant. The dragons of the king are still there, but the understanding improves little by little. Even some marriages are noticed. The king rents the grounds of the MT Aigoual of the Switzer Mister de Reuding, in exchange 300 catholic families are aloud to go to Switzerland. 1787 Louis XVI signs the Edict of Tolerance. It is not necessary any more to be catholic to be declared French. Jews and Protestants can live their faith. The register of births, marriages and deaths was held by the church, but the registers that the church refused, the 'clandestine ' documents were held by the already existing town halls. It took 3 years to arrange one century of the civilian registers. 1789 the revolution burns the registers of churches but not those of the municipal halls. With the Revolution the territorial limits are modified: the department of Lozere and Gard are created. Change for Meyrueis and Gatuzières of the dioceses of Nimes before.